More Than Half Of Internet Viewing Is On Mobile Devices, Can Your Site Be Seen Correctly? Google now penalise you if your website is not mobile friendly. That means that you fall down the search results. Have you ever looked at your business website on a smartphone, it can be viewed, but it is difficult to read, slow to load and difficult for your customers to access your great information. Over half of internet searches are performed on mobile devices these days, so if your site can not be seen properly then you are missing out. Also people are often out and about when they search on the mobile device, that means they may be looking for you right now. 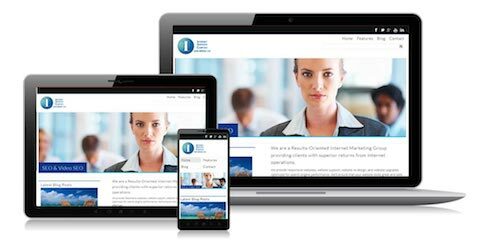 A mobile friendly website, is designed to show your information in a simple and efficient fashion, in a format that fits the size of the screen. A good mobile web site will also have a button to push for the customer to call now. This is a magnificent call to action, and will enhance the rate of calls to your business. You can even use your mobile website to capture customers phone numbers which will allow you to SMS them about deals or promotions that you have on. Mobilising your website is just a fundamental now. If you have a website, you need a Mobile website as well. The most streamlined approach to offering a cohesive mobile experience is responsive website design. A responsive website adapts its layout (the elements of your site — text, icons and imagery, navigation, etc.) to the size of the device used to access the site. It utilises a grid-based system and flexible image sizes to shift your content around as needed — no more pinching and pulling your mobile screen to zoom in and navigate around your site! Ready to talk about how we can help with your Brisbane Responsive Website Design project?